Mr Green Casino :: Go Bananas! video slot – PLAY NOW! Go Bananas!™ is a fast-paced 5-reel, 3-row, 20-line game featuring 5 different Wild Monkey symbols. Set in a tree house in the tropical jungle with mischievous monkeys, juicy fruits and glimmering gems, the game offers big win chances packaged with fun and sun. Whenever any of the 5 Wild Monkeys appear on the reels, they turn adjacent symbols into Wild symbols. If there is a win, the jovial monkeys come to life and celebrate the gain. This colourful video slot really gives the player an action-packed game with a monkey twist – so let’s Go Bananas! 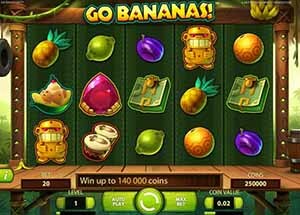 Go Bananas™ :: You can try this NEW Slot game right now at the following casinos: 24hCasino, Mr.Smith Casino, ZonCasino, Next Casino, iGame Casino, Jetbull Casino, Unibet Casino, Vera & John Casino, ComeOn Casino, Mr.Green Casino, EuroSlots Casino, Tropezia Palace Casino and RedBet Casino. ← Robin Hood Bingo :: Add £10 Play with £60!